One of Zapper PR’s much used online marketing techniques is the use of advertorials to spread the preferred message via travel bloggers to the target audience. One of those partners is KLM. Together with the Dutch airline we recently promoted two destinations on the Dutch and German market: St. Petersburg and Windhoek (Namibia). Sponsored articles are a great way to spread the message along different target groups. In consultation with KLM, Zapper PR found bloggers and influencers on the Dutch and German market that fitted the message we wanted to sent out. To reach the target audience the best and to create as much exposure as possible, all bloggers link to each other. On the bottom of each article you can find a special block that will have a teaser like: e.g. ’Do you want to know more about Windhoek?’ To make the different blogger advertorials fit together we gave each blogger a theme for things to do during their visit in Windhoek & St. Petersburg. Within this block we measure the impressions and clicks of all the blogs. By monitoring those results, we can optimise the campaign continuously. We promoted Windhoek and Namibia on the German market. 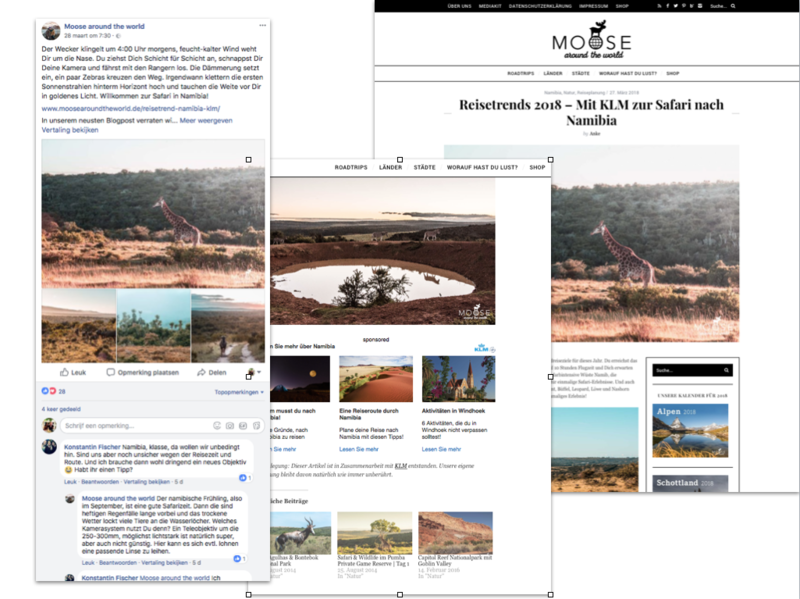 With poules of 4 bloggers we spread the message about the beauty of Windhoek and Namibia and try to stimulate people to visit the website of KLM where they can book their flight tickets for Windhoek. Themes that are used in this poule are: ‘A travel route through Namibia’, ‘Safari tips in Namibia’, ‘6 best activities in Windhoek’ and ‘5 reasons to visit Namibia’. In all articles you could find inspirational stories and photography to get people interested in the destination with the direct call to action in the last paragraph of the article. On the bottom of the article you can find the ‘Inspiration Block’ where the different bloggers link to each other (see picture under here). All articles are shared via their social media channels as well. We also worked on promoting St. Petersburg and the direct flights from KLM. This campaign run on the Dutch market. 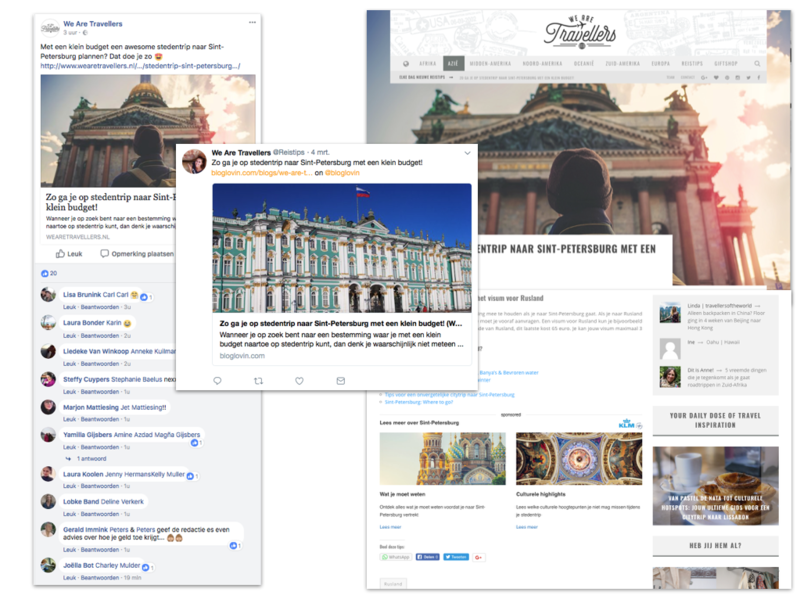 Besides an extended campaign on CityZapper for Sint-Petersburg we were also running a campaign with 12 different travel bloggers. These bloggers are divided in 3 poules of 4 bloggers, all with their own theme. Examples of themes used in the articles are: ‘St. Petersburg on a budget’, ‘The best bars and restaurants’ and ‘Outdoor activities’. In these articles there is also a paragraph about how to get there and a very clear call to action to the KLM website.